Passionate about empowering young people to be change makers through STEM, Townsville State High School head science teacher Sarah Chapman is committed to building networks within the community to enable inspiration, engagement, innovation, celebration and the championing of science and technology. Sarah is an active advocate for STEM education. 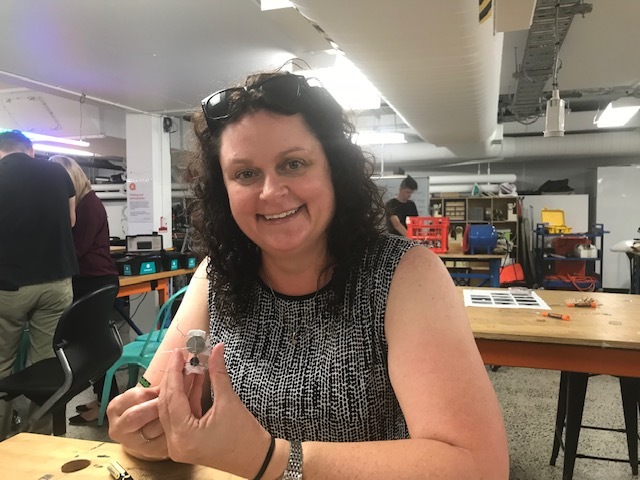 Named as a Science & Technology Australia STEM Ambassador and convenor of the Inspiring Australia Queensland STEM Hub based in Townsville, Sarah is also a highly experienced educator who was awarded the 2013 Prime Minister’s Prize for Excellence in Science Teaching. Sarah has used these awards and prizes to raise issues of education and equity with politicians and policy makers at all levels of government. “There’s no point in winning a Prime Minister’s Science Prize if you can’t make a difference and go beyond what you thought you could do,” she says. Sarah’s passion for STEM advocacy is infectious. She recently shared insights with other regional STEM Hub convenors at a Forum held at The Edge in Brisbane and organised by Inspiring Australia Queensland. Sarah’s message to STEM education advocates: use every opportunity to knock on doors and raise issues with decision makers who may be able to improve student outcomes, particularly for young women and regional students. In responding to a question about whether others could get the same kind of access to politicians that Sarah enjoys, she argues that we are all citizens and can raise issues with anyone we like. Sarah spoke to Forum participants about her own career journey and how she became motivated to become a leader in the STEM education sector. She is particularly passionate about promoting the importance of encouraging young women to pursue STEM careers and believes that many STEM industries continue to be male orientated. “While Australia is slowly making progress in terms of gender balance, much greater advocacy is required to engage young women, especially those in upper primary and lower secondary school,” she says, adding that in her own community, a big part of the problem is that parents do not understand what STEM careers entail. As a STEM Hub lead, Sarah has been successful in bringing scientists together to showcase their work within the local community. The recent STEM Faire held in Townsville attracted 1600 participants to the library for hands on experiences – an attendance result no one expected. Sarah advises other people wishing to build a STEM Hub to do a local scan to work out who are the people in your community who may be interested in joining a collaborative science engagement effort. “Once you have a committed group, it’s important to meet regularly and assign tasks, allowing others to step up and make things happen so that the responsibility does not always fall to the same few people,” she warns. Having so many projects on the go in addition to a full time teaching load means that Sarah has little time for rest, which is all the more reason why ensuring the sustainability of the Townsville STEM Hub through committed partners is a priority. Find out more about Sarah Chapman. Read more about the Townsville STEM Hub.